I added information on buses that were retired and auctioned off by MTC in 1985 and 1988. Yeah I do have sources to support what I posted via Google links (for the 1985 auction) and a magazine that I have which has an ad for buses going up for auction on February 3, 1988. I also added the renumbered buses that were rebuilt by Midwest Bus (which I found out the rebuilder was originally suppose to be Dickenson Lines and it was for 175 buses; 82 GMCs and 93 Flxible New Looks). Several AMGs and 1974 Flxibles were painted in the new paint scheme in the 80s, but were not rebuilt. Just painted to look good and same story for the 1966 TDH-5303s, which were not part of the rebuild, just 82 1963-1965 TDH-5303s and 58 1971 Flxibles (15 D6-1s and 43 D5-1s). Red colored buses were still running into the early 90s, with the remaining red buses being mostly AMGs, 1974 Flxibles, and some 1971-72 Flxibles that weren't replaced between 1985-1989. Also found out the 1971 Flxibles that had 6v71s used VH-9s. The rebuilt buses had power steering, what I assume are Vultron destination signs, body work done on them, overhauled or new power packs, and working AC (for the Flxibles only). All of these buses retired between 1994-1995 by the Gillig Phantoms, but I have a feeling some were still running as late as 1996 wearing RTB logos on them for contract services. Also the 1994 New Flyer D60s replaced all 20 1978 AMG/MAN artics. 208 is Ex-656 from Lynx. It was auctioned off in 2017 missing it's ZF transmission. 166 came from Palm Tran and it's 1999. The serial number on the Gillig next to 166 is 15GGD2111X1070870, indicating it's also a 1999 Advantage from Palm Tran. Those shots are awesome showing the good times. I'm not sure if anyone is aware of this, but this is an old ABC Companies inventory that lists all the buses they had for sale back in 2008 via the wayback machine. https://web.archive.org/web/20080829205409/http://www.abc-companies.com:80/inventoryResults.asp The MC-12's VINs have all been added already. The majority of these buses for sale on this list are Van Hools and a small number of MCIs. Just another example why I'm not active on transit forums, cause of individuals who think Wikipedia is all correct, individuals who outright don't listen the first few times after being told something, and some who are straight up inept. Arguing with men in their 20s-50s with massive egos isn't healthy and can make your hairline recede. Moving away from the trash that I don't care about, Palm Tran sold all, but 960 to Gainesville in early 2005. Those 1995 Flxible Metros. The buses were out of service by late 2004, so they only had a 9 year career there. 960 joined its sisters in 2007 along with the 30ft Phantoms. Amazingly, the 30ft Flxibles Palm Tran sold to Puerto Rico may still be kicking around. Considering some of the stuff I've been hearing about certain individuals who post over there, Subchat is tolerable as the trolls that were once there are gone. I won't go into details about what I've been finding out as it's pretty off topic as it is, but I'm glad the shenanigans are limited to mostly the northeast and a few individuals across the country. Melvin Bernero shot of an Ex-Palm Tran Advantage operating from Aries. They have several of these buses, including 40ft units from the 9900 series, which replaced the used Grummans Palm Tran had. Unfortunately yes. I normally don't go off topic, but the only good things that came out of me being there. One I met some really cool guys and two I learned a lot about people too. Things that I didn't need to know that is. How is he wrong, when he and a few users have already pointed out that Palm Tran isn't investing in CNG buses? What part of that is there not to understand? 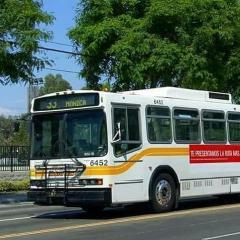 Plus I ride Lynx and the CNG tag is on those buses, so they're CNG. I see no CNG tag on Palm Tran's units, so they for the last time are not CNG. Are you going to stop making meaningless posts across the forum, when the answers to your questions are already in the thread and on the wiki itself? If so, the answer to your question is no they're not getting Advantages for the time being. You did a really good job finding out where those buses went and who owned them originally. I also discovered a few more buses that went to Aires as well, via license plates. I got the serials from them. 129 is Ex-Palm Tran 029 and 163 is Ex-Palm Tran 9915. I also have VIN numbers for 142 and 144. I also can confirm there is indeed a 202 for the Ex-Lynx BRTs, as I had to really look closer to make sure for the images on the Chicago Transit Forum. You also gotta thank Bob Hussey and Dave Colton as well. Bob took the shots and Dave uploaded them onto that site. Complete Coach Works in California did the refurbishment on those Flxible New Look buses between 1983-1985. They look smart in that new scheme too. Must of sucked to lose those two artics. Had they arrived, they would of lasted a little longer compared to their brief service life with Miami. Yeah ISL/L9 are the only engines availble unless you consider Volvo D13 or DD13s (Mercedez Benz engine with Detroit Diesel badge), but those are for motorcoach applications and I'm sure Gainesville has no routes that are good for motorcoaches as far as I know. As far as I know, all of Lynx's Phantoms from 1994-2005 used Thermo King. Lynx learned it's lesson after issues with Sutrak AC on the Orion IIs and Vs and they've never gotten anything else since then. Were these the buses in question that were wrecked? I wonder if this is the only time Gainesville ever bought buses from Miami?